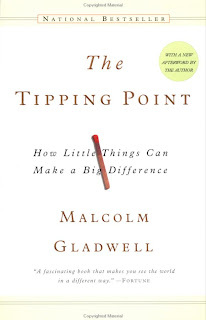 William Gladwell's The Tipping Point examines the combinations of small individual actions that could lead to massive social change. From the popularity of Hush Puppies shoes to the spread of disease in Baltimore to the dramatic drop in crime in New York, Gladwell traces and identifies the common characteristics of people and events that, although seemingly small in isolation, can result in significant behavioural shifts. He introduces us to essential characters like Connectors (those few people who have influence over a large social network), Mavens (the keen observers of the latest trends), and Salesman (the unique characters with persuasive powers to close the deal). Gladwell also addresses what he calls the Stickiness Factor (making the necessary but small changes needed to achieve success) and the Power of Context. The Tipping Point is an enthralling, easy to read book, and Gladwell's writing style is that of the sharp social observer who can compile and simplify information pulled together from a variety of sources. Which is not to say that the book, the author's first, is not without its faults. Gladwell can repeat concepts to the point of exhaustion, and at times he can certainly get lost in the details. There is a section about the elements of success of children's television shows, particularly Sesame Street, that goes into excruciating details, down to descriptions of individual scenes in specific episodes. Gladwell loses the overall plot in such segments, in a case of an over-examination of individual trees to the detriment of the health of the forest. But overall there are terrific lessons to be learned from The Tipping Point, the most important being that what matters most is not how much pressure is applied to a certain situation, but where and how this pressure is applied. Often, limited resources applied in just the right combination can have a far greater impact that huge but misdirected effort. It is a lesson well-worth remembering as much in everyday life as in the grand strategic world of international geopolitics. 280 pages, plus Notes and Index. Published in softcover by Back Bay Books.